From the very first shot, there’s tension humming underneath the phenomenal “Starred Up” that only intensifies as the characters deepen. The opening shot is shaky, reflecting both movement and the disorientation that comes with change. And the eyes of Jack O’Connell, a future star if ever I’ve seen one, are tight and coiled, first looking down to gather his thoughts and then glaring up at the unknown future of his destination. We see this young man going through the process of moving from juvenile care to being admitted to an adult prison, and it ends with his hands on his head and face. From there, in a new cell he’ll occupy for what feels like a long time, he does push-ups, he crafts a shiv, he paces like a caged animal—all before a single line of dialogue. Director David Mackenzie trusts his actor and O’Connell puts more performance up there on the screen in body language than most performers do with an entire script. It’s almost ten minutes before he speaks (and even that, to be fair, is so heavily accented and mumbled that I’m not sure I could tell you what he says), but we know Eric already through visual composition, physical performance, and the other tools that average films often ignore in favor of over-expository dialogue and false declarations of emotion. “Starred Up” is not an average film. 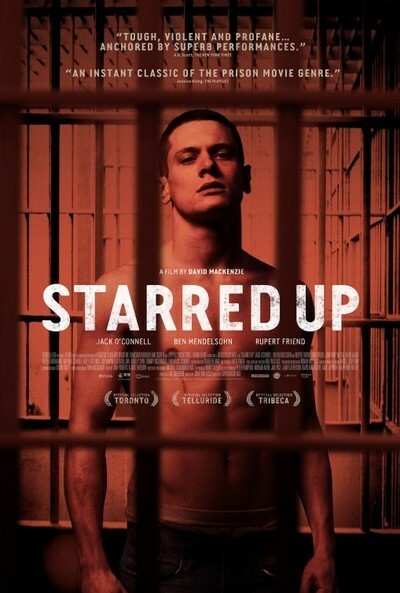 It’s hard to describe “Starred Up” without making it sound generic. It’s another prison drama, a genre that felt exhausted many, many years ago. And it’s another tale of a genetic predisposition for violence as we soon learn that Eric’s father Neville (the great Ben Mendelsohn of “The Place Beyond the Pines” and “Animal Kingdom”) is in the same prison as his son. Neville first spies Eric across the yard and glares him down in the way a disappointed parent does before a beating. Eric has been thrown into an ultra-violent, alpha male world, and it’s not one where having your father around is necessarily a good thing. Human connection, for both of these men, will prove to be a double-edged sword. In many ways, it’s a work about a father’s anger that both protects and derails his son. Eric will have another father figure in his life, a group therapist named Oliver (Rupert Friend), who convinces the prison Governor (Sam Spruell) to give the young man a chance at rehabilitation after a particularly violent incident. In group sessions that almost always end in outbursts and violence, Oliver does his best to try a different parental tactic with Eric. There’s a defining scene in which Eric flouts authority by lighting up a cigarette in group and Oliver tries discipline—verbal admonition and essentially putting the group in a “time out”—before Neville bursts in with the physical response: “Problem is you’ve got to come down on him full throttle; else it won’t register.” It’s corporal punishment versus detention even in the prison system. The dynamic between a biological father and a father figure behind bars is fascinating; both men try to protect him and both simply cannot in this kind of world. While all of that subtext makes “Starred Up” fascinating, it is primarily a character piece for the young Mr. O’Connell, an actor who reminds one of Tom Hardy in “Bronson” or the early work of Ryan Gosling in his fearlessness. There’s a scene early on in which Eric knows the guards are coming for him. He races back to his cell, pours oil on the floor, and then douses himself in the stuff too. It’ll make it harder to take him down. And he grabs a couple of wooden planks for good measure. He’s not getting “out.” They have nightsticks, helmets and shields. But he’ll do some damage on his way down. “Starred Up” is a film about someone sliding out of society, and kicking, screaming and punching as he does so. And O’Connell captures that in a way that so many more experienced, well-known actors would miss. It’s in the incredible physical balance between prison-earned toughness and youth. There’s just a hint of fear in O’Connell’s eyes, reminding us that he was just a kid not that long ago. O’Connell’s performance is matched but never upstaged by the increasingly fantastic Ben Mendelsohn, an even more blatantly conflicted blend of rage and familial concern, and Rupert Friend. “Starred Up” is HEAVY with slang and accents. You won’t understand a third of it. But there’s so much going on in between the lines of dialogue that you won’t care. We’ve seen many visually arresting films in recent years and character studies are as common as film festivals, but it’s the remarkable blend of the two here that makes “Starred Up” devastating. From Mackenzie’s camera choices—often tracking in one shot from relative calm like inmates playing ping pong to an outburst in the distance down the hall—to the sound design of clanking metal doors and distant cries, “Starred Up” is a technical achievement anchored by the clarity of character in O’Connell’s performance. It’s fantastic.